A new report entitled Chinese Direct Investment in California published by the Asia Society finds that California has attracted more Chinese investment deals than any other U.S. state but remains fifth in the nation in total investment value. Negligible before 2008, Chinese investment in the state is growing at triple-digit levels and could reach $60 billion by 2020, but only if the state and private sector do a better job working together to attract Chinese capital. The report is co-authored by Daniel H. Rosen and Thilo Hanemann of the Rhodium Group and builds on a 2011 Asia Society study, entitled An American Open Door? : Maximizing the Benefits of Chinese Foreign Direct Investment, which looked more broadly at Chinese investment into the U.S. The new report is the most comprehensive study to date of Chinese investment in the Golden State and in the U.S. overall. It finds that the potential gains for California and China are enormous but that success is far from guaranteed. U.S.-China relations remain tense and protectionism is a serious threat. At the state level, California has had a mixed record of promoting its economic strengths. The report urges policy and business leaders in the state to do better to out-compete other states, and nations, that seek to increase their own shares of the Chinese outbound investment surge. Four decades ago, Japanese direct investment in the U.S. was at a similar stage. Now, it totals some $300 billion, employs 700,000 Americans, and undergirds a strong, stable U.S.-Japan relationship. Investment and trade between the U.S. and China show even greater promise today. Compared to the rest of the U.S., the report finds that Chinese investment in California is disproportionately from private rather than state-owned enterprises, greenfield rather than M&As, and strongest in high-tech and high-value services — areas that the Chinese government and private sector have targeted for accelerated growth. Of the $1.3 billion in Chinese investment in the state since 2000, Southern California leads the state in investment with 69 deals totaling $618 million. The San Francisco Bay Area and Silicon Valley/South Bay regions are the second and third most attractive regions for Chinese investors. Understand California's value to China. The state's economy is the largest in the U.S. It has strong competitive advantages in high-tech sectors like software, IT, electronics, and cleantech. The state has long ties with China and has one of the most highly educated, multi-cultural workforces in the world. Target the right Chinese firms. High-tech firms in China seek what their California counterparts have: technology, know-how, and market experience. This is also true for high-value services in China seeking to move up the value chain. The Chinese government has identified exactly these areas as priorities for future economic growth. 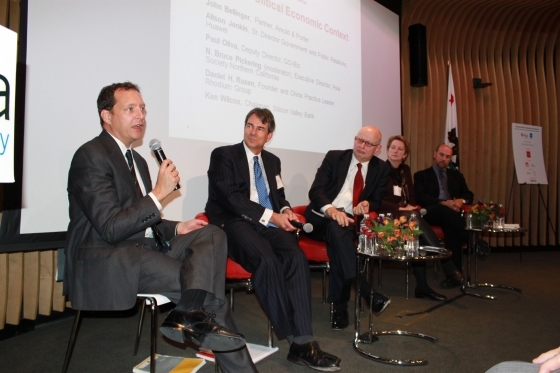 Step up California's investment promotion efforts. Continued growth of Chinese investment is not foreordained. Competition from other states, and nations, is intensifying, and the traditional hands-off approach is outdated and inadequate. The state's new GO-Biz office is an encouraging development, and more must be done to support innovative local initiatives such as ChinaSF in San Francisco. Lead the way to help resolve national anxieties over China. Growth in China's U.S. direct investment has rekindled old arguments about foreign firms and the national interest. While security screening of foreign investments is both necessary and legitimate, concerns can be politicized for protectionist ends. California has more self-interest than any other state to offer solutions based on its experience with successful, and failed, deals and a sophisticated understanding of cutting-edge industries. The report was launched on October 10, 2012 at a San Francisco conference featuring San Francisco Mayor Ed Lee and a host of business leaders and investors from California and China. In Southern California, the report was released at an October 11, 2012 conference featuring former Secretary of Commerce and U.S. Special Trade Representative Mickey Kantor. The Chinese-language version of the report was released at an event in Shanghai on November 15 and in Beijing on November 16 in conjunction with the 2012 Caixin Summit. Sponsored by Silicon Valley Bank, Wells Fargo, Citibank, New Enterprise Associates, USC's Marshall School of Business, and through the support of Jack Wadsworth.